He used to be on stage performing as a member of ‘NSYNC, surrounded by screaming girls. 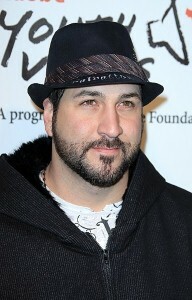 Not too much has changed for the former boy band member and Dancing with the Stars alum Joey Fatone. He’s surrounded by (sometimes) screaming girls at home, too – wife Kelly and daughters Briahna, 9, and Kloey, 9 weeks old. Fatone does admit, however, that the cries he’s hearing these days from baby Kloey are a bit harder to figure out. "When she cries, I’ve already fed her, I’ve already changed her  I’m like, what is wrong?!" Fatone, 33, told reporters at a recent New York City restaurant opening. "I turn you this way, I turn you that way, do I have to hold you, do I have to rock you? What’s the deal?" Big sister Briahna has stepped right up to her new role. Fatone says she loves to help out with the baby, for the most part. "She won’t change the diapers yet. But she will feed the baby, she’ll burp her, she’ll hold her, she’ll make sure she doesn’t cry. She’s loving it, she’s awesome," he said.